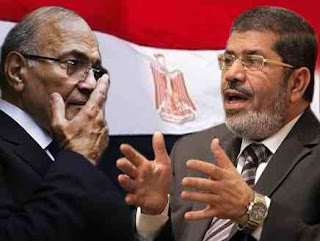 As first results on May 26 already indicated, there will be a second ballot to decide between Morsy, the presidential candidate of the Muslim Brotherhood, and Shafiq, the former prime minister of ousted president Mubarak. This ballot should take place on June 16 and 17, 2012. 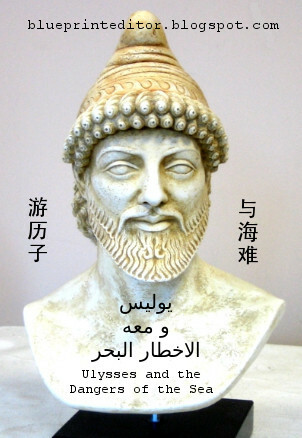 وجاء مرسي في المركز الأول بنحو 5 ملايين و764 ألفاً و952 صوتاً، وشفيق في المركز الثاني بـ5 ملايين و505 آلاف و327 صوتاً، فيما حلّ حمدين صباحي ثالثاً بنحو 4 ملايين 820 ألفاً، وعبدالمنعم أبوالفتوح رابعاً بحوالي 4 ملايين 650 ألفا، وجاء عمرو موسى في المركز الخامس بحوالي مليونين و588 ألفاً 850 صوتاً. The counting of 95% of the votes in the presidential elections of Egypt and first results are indicating the necessity to enter into a second round [of voting]. The Party of Liberty and Justice is calling [all] political currents in Egypt [to participate] in a dialogue in order to save the revolution. 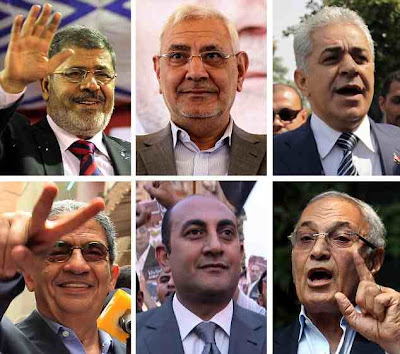 First results of the presidential elections in Egypt are seeing Mohammed Morsy, candidate for the Party for Liberty and Justice in the lead with 25% of the votes, followed by Ahmed Shafiq, last prime minister of the Mubarak era, who gained 24%. 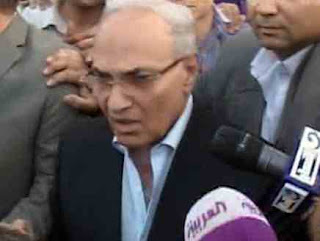 A rather low result of 11% reached Amr Moussa, the former secretary general of the Arab League. Independent candidate Hamdeen Sabahi has lodged a complaint at the central election committee because of irregularities that happened during the voting. Two other candidates joined him. The necessity of a final ballot becomes even more visible. Al-Jazeera Arabic TV: On Friday, May 25, Syrian military killed 92 persons comprising 32 children in Houla, community in the outskirts of Homs. Syrian state television blamed "terrorists" for that massacre. Pictures were shown on Sunday morning, May 27, in the frame of "Revolution Talk", a special broadcast by Al-Jazeera on their Arabic channel. In that program participated Abdel-karim al-Sharida (below), president of the Arabic organization for human rights from Amman/Jordan, among other participants from Beirut/Lebanon, Doha/Qatar and Homs/Syria. The Emirates are calling the [Arab] Ligue to an urgent meeting on the Syrian massacre. The Council of Cooperation for the Gulf feels obliged on the matter of that "massacre" and is following with increasing concern such sad development. According to Al-Arabiya the death toll of the Houla massacre should have reached "more than 106"
Mubarak lurking from behind ! Today, about 50 million Egyptian voters are called to participate in the first democratic presidential elections while 300.000 members of police and armed forces are being deployed to provide secure proceedings. Former U.S. President Jimmy Carter has arrived in Kairo as an independent observer. Al-Jazeera Arabic TV is continuously reporting from Kairo, Alexandria, Gizeh and other places while the unpredictable outcome of the elections will be overshadowed by severe differences within the Egyptian society, only to mention the influence of Islamist representatives who have been refused acceptance as legal candidates. Polls did not start closing until 9:00 pm (1900 GMT) after authorities ordered a one-hour extension. A second day of polling is to be held on Thursday, with preliminary results expected on Sunday. لجان الاقتراع في مصر تغلق أبوابها في اليوم الأول من الانتخابات الرئاسية Voting [committees] in Egypt are closing their doors on the first day of the presidential elections. رئيس اللجنة العليا للإنتخابات الرئاسية في مصر Farouk Suldan, president of the high commission [in charge of] the presidential elections in Egypt. Voting centers in Egypt are closing, ... Washington is among the supporters [of the elections] ... Toll of victims [due to violence] during the presidential elections has risen to 13. 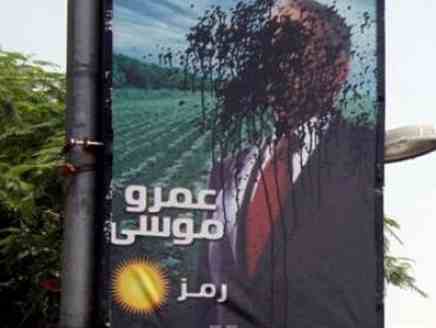 Image below: A damaged election poster for Amr Moussa, former secretary general of the Arab League and who gave up his position to take chances in the Egyptian elections. Nevertheless, he still seems to be one of the most appreciated candidates. Same goes for Ahmed Shafiq (below), a former minister under Mubarak. He came under attack from protesters who threw stones and shoes at his convoy as he voted at a Cairo polling station. 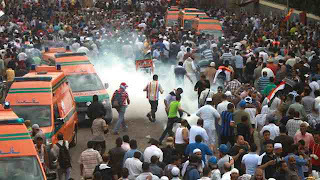 During the first day of election one Cairo policeman was reported to be shot in a gunfight between followers of different candidates. 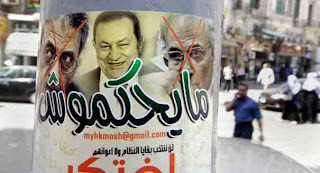 (Top-Left to Right): Mohammed Mursi (Muslim Brotherhood's Freedom and Justice Party) , Abdel Moneim Abu al-Fatuh (Independent), Hamdeen Sabahi (Dignity Party). 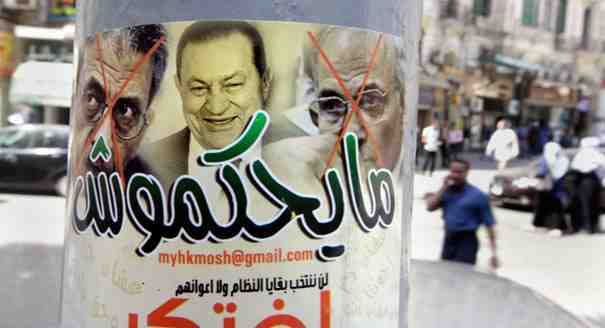 (Bottom-Left to Right): Amr Moussa (Independent), Khaled Ali (Independent) and Ahmed Shafiq (Independent). First step to commercializing space transport. SpaceX, a California based private company, has launched a space module that is expected to dock at the international space station ISS as soon as next Friday. According to news reports from CNN and BBC, their new space vehicle should be less expensive than the outdated spaceshuttle which is no longer available after NASA stopped that program. Charles Bolden (image below), NASA administrator for the ISS project, stated that America would remain the leading nation in space flight, even though a private company took over. Recently, U.S. space flight relied on Russia that provided their carrier system. "The North Korean side has stated that our fishing boats and boat crews that have been detained are already entirely released and [sent] back." Meanwhile, the maritime incident of Huangyan Island in the South China Sea remains to be solved as territorial claims of, both, China and the Philippines have created a problem of general importance. 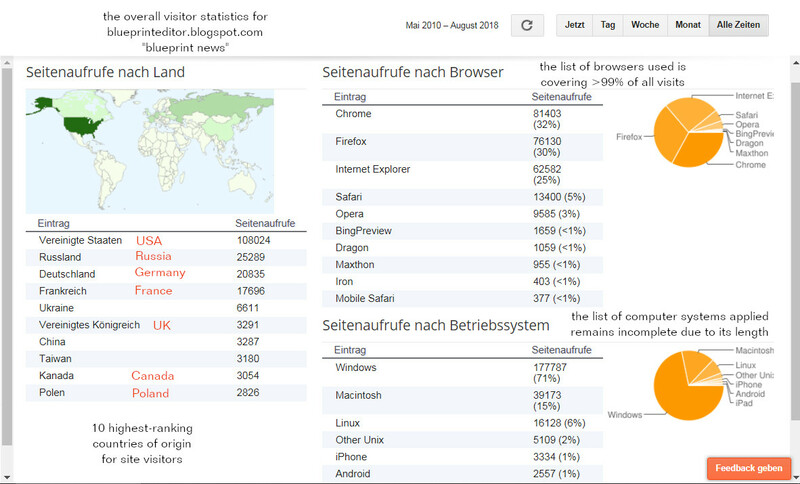 For further information look at a related blogspot of mine. Iran brings about charges against 13 [persons] accused of espionage for Israel. They were recruited by the apparatus of "Mossad" for the operation of [satellite] channels in the propagation of fake propaganda. 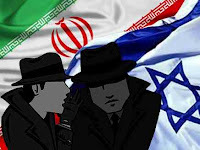 Section 15 of the Revolutionary Tribunal [on behalf of the regime in] Tehran summoned [for justice] 13 people being accused of espionage in favour of Zionism.
" Terrorist engaged in attack on fortunate hero [nuclear scientist] ". 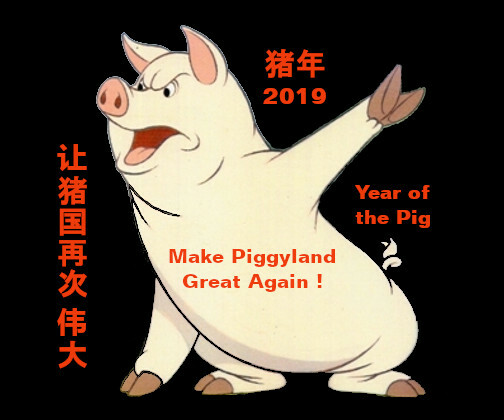 In this blogspot I quote different Chinese sources highlighting the actual rise of tensions between China and the Philippines. While China is still "policing" the South China Sea, Western powers and their East-Asian allies are increasingly interested in unrestricted traffic in China's "swimming pool". Recent Development: Chinese and Philippine vessels have been locked in a high seas stand-off since China's PLA Navy prevented a Philippine warship from arresting crews of Chinese fishing boats near the Scarborough Shoal, also known as Huangyan Island, on April 8. Reports in Japan said five Chinese warships – including two guided missile destroyers, two frigates and an amphibious landing ship – had passed through waters close to Okinawa moving to Philippine reefs. 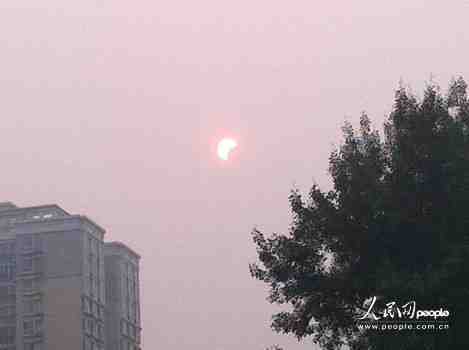 Beijing also issued a travel advisory warning its citizens to keep a low profile while being in the Philippines. As the dispute escalated, Leon Panetta, the US defence secretary, met senators in a push to ratify a treaty that would bolster legal backing for US naval patrols in dispute regions such as the South China Sea. 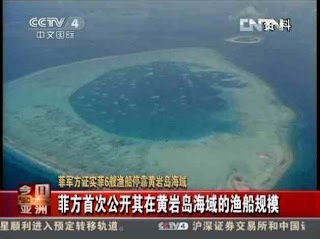 Is there any Chinese comment on the current situation of Huangyan Island ? Will the [military] command resort to some new responsive steps ? 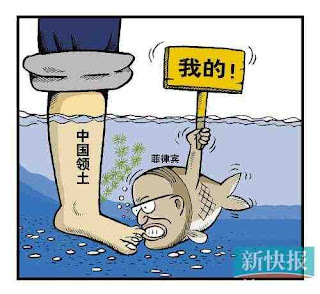 In the current situation of Huangyan Island, our position is clear-cut. We emphasize that Huangyan Island is China's inherent territory. China has there indisputable sovereign rights. The Philippines should earnestly respect China's territorial sovereignty. In the meantime, China tries to settle the current situation by means of diplomatic consultations while [its] position hasn't changed. UPDATE from People's Network on May 14, 2012: 菲称永不同意中方对黄岩岛要求 旅游业吁结束对抗 The Philippines state they would never approve of China's claim of the Huangyan Island [area] while tourism industry is pleading for an end of the fighting. 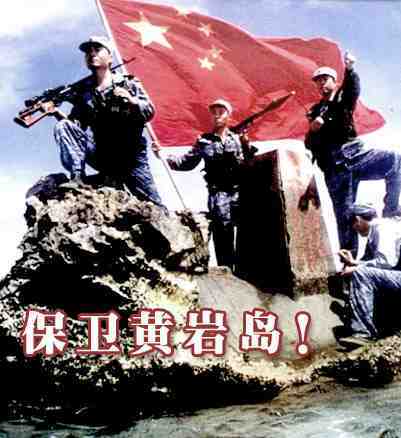 Journal of the People's Liberation Army: Those who are provoking in the South [China] Sea are hoping that China gets angry enough to wage war. 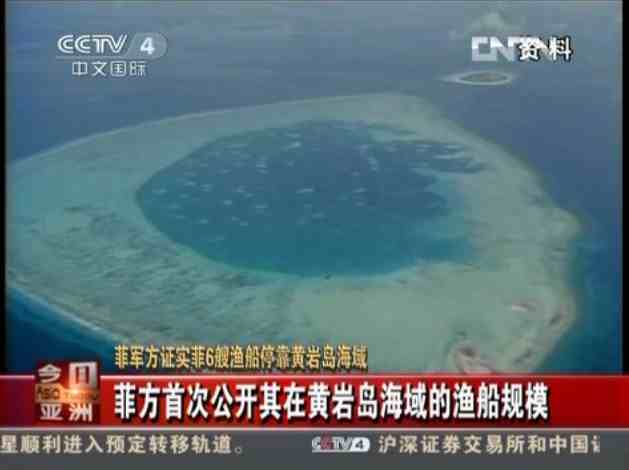 Recently, the incident of Huangyan Island [Yellow Rock Island] between China and the Philippines became a central issue of the South [China] Sea question. [As] the reasonable, self-restraint and careful diplomatic answer of China's government seemingly not obtained approval by the Philippine government, the Philippine side is now reaching for high risks on a single venture, obstinately [preferring] a final taste [of the matter]. The presumptuous, impolite and ignorant words and deeds of the Philippine side undoubtedly sent a perspective full of variables to the peaceful settling of the Huangyan incident and is stirring up China's masses to the utmost indignation, [thereby] putting at test the strategic knowledge of China's government when it comes to respond to [that] crisis. India for the first time involved in the conflict of the South [China] Sea issue. - Admonishing China and the Philippines to maintain self-restraint. "Defend Yellow Rock Island !" Only to think that they made us believe Hollande being the captain of a pedal boat. Not at all: He's the captain of a caravel ! Who is the greatest socialist in history ? The answer is: Christopher Columbus. When he left, he didn't know where he was sailing to. When he arrived, he didn't know where he was. And all that with the money of other people ! Comment: Even though, Hollande won the presidential elections in France, it will be hard enough for him to reach a consolidation of his country's economy without those austerity measures planned by his competitor Sarkozy. May 6 UPDATE further down ! This is a letter authored by Osama Bin Laden and it is addressed to "Sheikh Mahmud" [`Atiyya `Abd al-Rahman], another high-ranking leader of Al-Qaeda. It can be assumed that this document came into being not before May 2010. Bin Ladin’s letter is concerned with the mistakes committed by regional Jihadi groups, which have resulted in the unnecessary deaths of thousands of Muslim civilians. Bin Laden indicates that he would like to start a “new phase” so that the Jihadis could regain the trust of Muslims. He directs `Atiyya to prepare a memorandum to centralize, in the hands of Al-Qaeda's Command, the media campaign and operations of regional Jihadi groups. Bin Laden's evaluation of certain regional Jihadi operations might have influenced his decision to decline a request for formal unity with Al-Qaeda by Somalia's Al-Shabab group. In fact, Al-Shabab only merged with Al-Qaeda after the death of Osama Bin Laden [Document SOCOM-2012-0000005].
" We do not see escalation as necessary at this point because we are in the preparation stage; therefore, it is not in our interest to rush in bringing down the regime. In spite of this regime's mismanagement, it is less dangerous to us than the one America wants to exchange it with. Ali Abdallah Saleh has been unable to suppress the Islamic activity and has been considered to be a non-Muslim man and supporter of the West during the past years. On the contrary, the Salafists and the Jihadist Salafists were able to take advantage of his regime and target America from Yemen, as some of the Mujahidin went to Somalia or traveled to us, which allowed us to assign our brothers to conduct international operations. " Shortly after the Abottabad raid, Bin Laden's widows and their children, living in the same place, were put under arrest by Pakistani authorities. They have been released on April 27, 2012, and flown to Saudi Arabia. In the frame of most violent demonstrations in the Abassiya neighbourhood of Kairo on Saturday, May 5, a prominent figure related to Al-Qaeda appeared among many protesters in support of Islamist candidate Hazem Abu Ismael, who is among a number of candidates disqualified from the May 23 presidential election. Headline: Brother of al-Qaeda leader appeared on Abassiya Square [original: Field of the Abassides]. Headline: The eldest brother of [Ayman] Zawahiri participated in the protests [where], for his protection, banners of the "Black Society" were raised. Info: Ayman Zawahiri is the successor of Osama Bin Laden as leader of Al-Qaeda organization. He originally came from Egypt and is considered to be connected with the country's Muslim Brotherhood. Yesterday, a witness appeared with news from Abassiya Square [i.e. 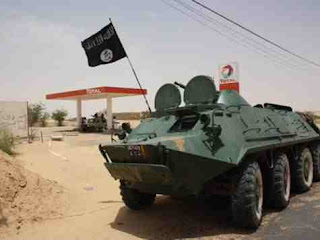 Abassides field], [claiming] a participation of Mahmud al-Zawahiri, the eldest brother of al-Qaeda's leader Ayman al-Zawahiri, in the demonstrations where, for his protection, banners of al-Qaeda organization were raised. And Zawahiri mentioned his liberation one month after the retreat of former president Mohammad Hosni Mubarak, [under whose rule] he was imprisoned on the background of being involved in an operation [directed] at the assassination of deceased president Anwar al-Sadat. Headline: Al-Qaeda organization fighting a spiritual center in Northern Mali. 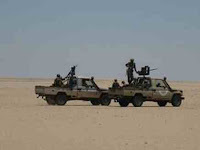 Destruction of a religious place in Timbuktu, town of tourism in Northern Mali, by elements belonging to the Islamic Maghreb [branch] of Al-Qaeda organization, yesterday, Friday [May 4]. [The place] is being enrolled on a UNESCO list for global [cultural memorials]. There was "no shocking" [or: disturbing] of the inhabitants [during the destruction] declared a local responsible on Saturday.